Today is our dear Blessed Mother's Birthday! 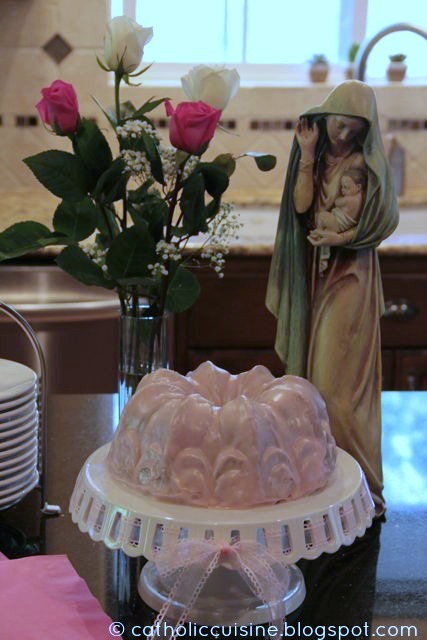 We are hosting a Mother/Daughter tea at our home this afternoon so I decided to make a special cake for Our Lady. Iris: The iris or "Sword Lily" is an emblem of Our Lady's Seven Sorrows. Lily: The Lily, symbol of virginity and purity. There is also a white day lily which only blooms during the time of the Assumption in mid-August and is known as the Assumption Lily among horticulturalists. The species here is very similar to the Assumption flower. I also opted to just use a cake mix, since baking the cake was just one little thing to check off my long to-do list for the tea party, but you could make it from scratch if you'd prefer. I basically just wanted to share the glaze with you all. I thought it turned out pretty! Bake cake according to directions on the box, or use your favorite strawberry cake recipe. Beat butter, powdered sugar and lemonade concentrate until light and fluffy. Transfer to pan and heat until the icing is quite runny. Spread the frosting on the cooled cake. Impart unto Thy servants, we beseech Thee, O Lord, the gift of Thy heavenly grace, that to us, for whom the childbearing of the Blessed Virgin was the beginning of our salvation, the votive solemnity of her nativity may give increase of peace. Through our Lord. Amen. Thou art my Mother, O Virgin Mary: keep me safe lest I ever offend thy dear Son, and obtain for me the grace to please Him always and in all things. Amen. I came here to scramble a last minute dessert for the nativity of the Blessed Mother. :) Didn't have time to go to the store so I made do...I made a regular bundt cake, and instead of pink lemonade, I chanced upon some marachino cherries in the back of the fridge and used the juice, lol. I love that pan of yours though...it's on my amazon wish list! 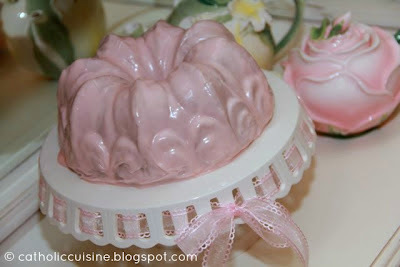 Beautiful - we made the Jell-O cake this year, but I'm filing this away for next year. Beautiful - I'm pinning this for next year! Wow! Pretty in pink! And thanks for the educational tidbits on the iris and lily.